My wife and I were finishing a hike into Coachwhip Canyon yesterday morning and were approaching our car when we heard a great deal of troglodytic commotion nearby. We'd been seeing and hearing individual Rock Wrens frequently during our two day stay in the area, but we counted six in this wrangle of wrens. I'd been photographing flowers to this point, but had the presence of mind to grab the long lens from the car and check the situation out. We saw two adults and two juveniles (capable of at least short flights) for sure. We're not sure of the ages of the other two. Examination of photographs shows the juveniles to be very recently fledged, sporting very stubby tails and bills for the species. I observed both begging and feeding behavior. I wouldn't mention this here but for the time of year. As I understand it, this is exceptionally early for Rock Wrens to be feeding young. The earliest reported eggs being February 5th (Bent 1948). Given that incubation is about two weeks, and the young had fledged, the eggs must have been laid in early February. Such early broods are known to occur when food sources are good, so here's an indicator that this will be a good year for desert birds. Perhaps paradoxically, it may not be as good for birders, as the birds can be more dispersed when food isn't concentrated in a few locations. Regardless, it was fun to watch, and I may never again see so many Rock Wrens in one place. This is actually a message for Rick Grove who was leading the bird festival group in South Bay. Our “red-masked Parakeets” were actually two Burrowing Parakeets!!! for everyone else, seen 02/28/2019 around 0730 hours, from the dirt lot south of the sod farms. Hi folks…we are three eastern birders visiting San Diego. This morning all three of us spotted a male American Redstart in the Bernardo Bay Trails area near Lake Hodges, approximately 300-400yds from the lake. Approximate GPS coordinates. 33.053389, -117.082245. We assume this is a relatively rare bird here in SD county, but we are extremely familiar with them from birding back home. We don’t have good photos because it was feeding actively in a rather thick bush….all that is visible is a black-and-orange blur. Sorry for bothering you if this bird is not rare here. At the southeast corner of the eastern lake at Lindo Lake around 11:00 one of the 6-8 people there spotted the alleged Yellow-bellied Sapsucker. One of my photos shows that it does not have a red nape.The photographers were wishing the bird would leave the shade for a sunny spot. 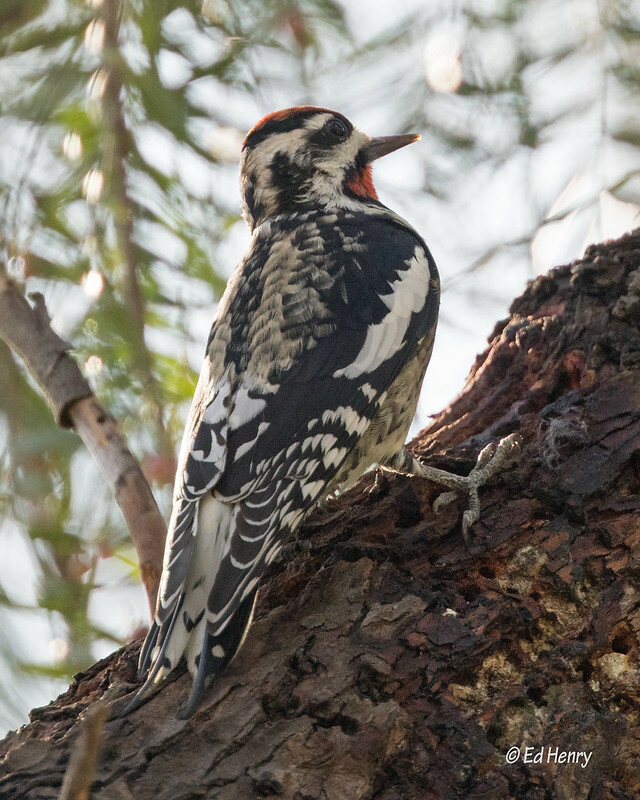 Wednesday 27 February: PresumedYellow-bellied sapsucker continues in SE corner of park. Currently drilling new wells in a Live Oak on the grassy slope southwest of the large Peruvian pepper it is oft reported in. Well seen at < 10m. Diagnostic aid for YBSA of completely black outlines around small red throat and head patches easily visible along with sapsucker white bars on front edge of folded wings. 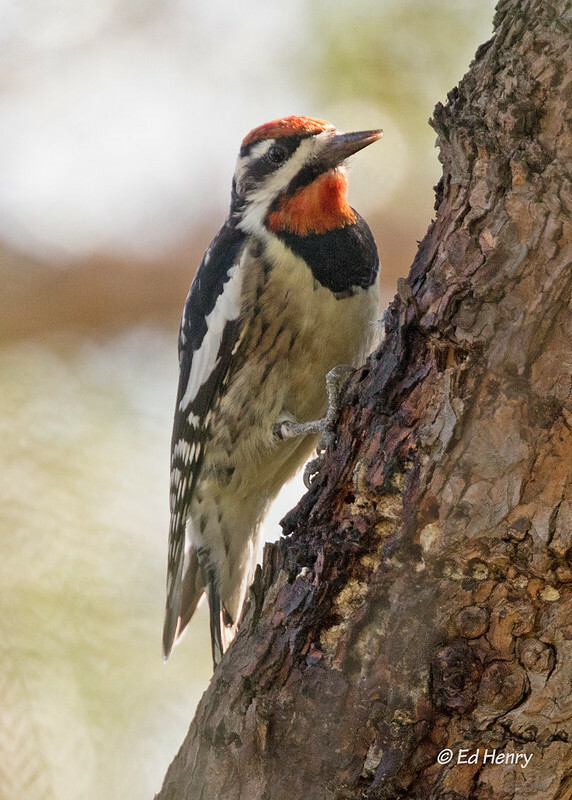 No red on nape or lower breast, however back does show numerous gold spots in somewhat symmetrical pairs and less white barring, more like a Red-Breasted sp. Acorns remain in area as well. I birded the park this morning and found 2 Mountain Chickadees in the oaks in the grassy valley between road and parking lot. Here are some continuing rarities that have been around much of the winter. More specific directions for each, if needed, should be gotten from earlier SanDiegoRegionBirding posts or from eBird reports. On Feb 25, the wintering Sage Thrasher continued along the fence at Crown Point (north side Mission Bay), from Crown Point Dr. X Roosevelt south 100+ yards to the entrance road down to Mission Bay Park. On Feb 27, the Clay-colored Sparrow continued at Torrey Hills Neighborhood Park in Sorrento Hills (access off Calle Mejilones X Mariposa), seen early in the morning along north edge of playing field(s) with flock of White-crowneds; the Grace's Warbler continues at 1282 Crest Drive in Encinitas, where it also periodically would fly across to the smaller pines and large eucalyptus tree directly across the street; and the Chestnut-sided Warbler continues in the lerpy eucs at marker 17 along the Lagoon Trail along the north shore of Batiquitos Lagoon in Carlsbad–be aware that by far the easiest way to access this site is to park at the Aviara golf course parking lot along Batiquitos Drive, just slightly to the east, and walk past the "starter's shed" on the signed PUBLIC walkway to the Lagoon Trail and then walk west to marker 17–the entire walk from car to the warbler is ONE minute, rather than having a much longer (but pleasant birding!) walk from a small parking area well to the west that also was the site of multiple car break-ins a while back. Off Poinsettia, there is a continuing Mountain Chickadee. The only new bird of any note that I've seen in the past couple days is a very lowly Western Tanager in residential Point Loma. Thanks to Eric I was able to go out and relocate the male Yellow-Bellied Sapsucker. It appears to me there are two? So at first I was a little confused and thought the male was a red-naped. However, there is no red nape on this bird!! I could not locate the female, but the male was hanging out for about 1 hour in the same spot. Here is the link to a video that shows the bird and where I located it…. Enjoy and good luck!! !